NCCS is proud to have the opportunity to partner with organizations and industry leaders in the cancer community. Without their continued support, NCCS would not be able to create the quality programs and resources that help improve the quality of life for all people touched by cancer. We would like to take this opportunity to thank all of our generous partners and sponsors for their continued support. 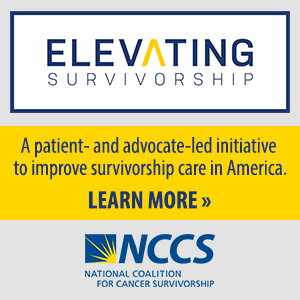 The National Coalition for Cancer Survivorship (“NCCS”) is a national 501(c)(3) advocacy organization representing cancer survivors and their families. NCCS often partners with corporations on events, programs and educational materials. The following policy was developed to help guide and more clearly define our corporate partnerships. NCCS will not endorse in any of its materials, literature or events any specific product or product name. Written materials produced by NCCS may list the corporation’s name but may not, under any circumstance, provide endorsement of a specific product, treatment or protocol. NCCS will not, under any circumstance, link from its website to any product-specific websites. All grants provided to NCCS for programs or materials are unrestricted educational grants. While NCCS may seek input from time to time from its corporate sponsors, NCCS maintains final approval and copyright over all program and material development and speaker selection. All materials and programs developed by NCCS are the property of NCCS and must carry the NCCS copyright, and as such, cannot be changed, modified or duplicated without prior written permission from NCCS. All speakers at NCCS programs will be required to disclose their relationship with the corporate sponsor. NCCS will not, under any circumstance, accept contributions from corporations contingent on any public policy position and/or public policy activity. NCCS maintains total independence and ultimate authority over its policy-making activities separate and apart from any corporate partnership. NCCS reserves the right to sever any corporate partnership with, and return contributions from, an entity that participates in public policy activities that NCCS finds offensive or that are in significant conflict with NCCS public policy activities and/or positions. Any corporate partner wishing to reference NCCS or any NCCS project, publication or position must first seek the prior review and written approval of NCCS. NCCS will not sell or release its mailing and/or email list to its corporate partners. If you have any questions about NCCS’s Corporate Sponsor Policy, please contact us at 301-650-9127. For information on sponsorship and funding opportunities, please contact Elena Jeannotte at 301-650-9127 or ejeanotte@canceradvocacy.org.